Rock lobsters are the most commercially valuable of New Zealand’s inshore fisheries species. Two species of rock lobsters are taken in New Zealand coastal waters. The red rock lobster (Jasus edwardsii) supports nearly all the landings and is caught all around the North and South Islands, Stewart Island and the Chatham Islands. The packhorse rock lobster (Sagmariasus verreauxi) is taken mainly in the north of the North Island. The rock lobster fisheries were brought into the Quota Management System (QMS) in 1990, when Total Allowable Commercial Catches (TACCs) were set for each Quota Management Area (QMA). In the commercial fishery, rock lobster are harvested using baited pots. Total commercial catch of rock lobsters has remained stable between 1990-91 and 2014-15, albeit catches have fluctuated within individual QMAs. The rock lobster fishery also supports important recreational and customary catches. The National Rock Lobster Management Group (NRLMG) is the primary advisor to the Minister for Primary Industries on catch limit, regulatory and other management actions that apply specifically to rock lobster fisheries. The NRLMG is a national-level, multi-stakeholder group comprising representatives of customary, recreational and commercial fishing sectors and the Ministry for Primary Industries. Every year the NRLMG considers the results from stock assessments and the operation of management procedures. These determine whether catch limit changes are required for the upcoming fishing year to ensure the sustainable use of the rock lobster resource. The risk assessment covers over 90% of rock lobster caught commercially in New Zealand. The core components of the harvest strategy are largely consistent across each of the rock lobster stocks. The primary constraint on catch is through the application of a total allowable catch (TAC), divided into a total allowable commercial catch (TACC) and allowances for recreational and customary catches and other sources of mortality. TACs are set using management procedures in all rock lobster fisheries except for CRA 6 and CRA 10. In general, each procedure is designed to move or maintain stock abundance well above agreed reference levels. Management procedures are evaluated with a modified stock assessment model, known as the ‘operating model’. Data used in the stock assessment model include: customary, recreational, commercial and illegal catches, length frequencies of the catch from observer and industry logbook data, tag-recapture data (i.e. growth information) and larval settlement levels. The most important inputs to the assessment are commercial catch per unit effort (CPUE) indices, which are considered to be proportional to abundance. A substantial body of information is available on stock structure and productivity of J. edwardsii from New Zealand. Catches in the commercial sector are closely monitored consistent with the compliance regime under the QMS, while catches in the recreational and customary sectors are estimated using fisher surveys and other techniques. The key input into the management procedure, standardised CPUE, is monitored and estimated for each stock. Collectively, this information is sufficient to support the harvest strategy across all stocks. Rock lobster potting is one of the most highly targeted fisheries in New Zealand. The pots are designed to be most effective for lobsters, so fish catch is incidental. Escape gaps provided for sublegal lobsters to escape also allow many fish and invertebrates to escape. The results of stock assessments utilising formal management procedures provide some objective basis for confidence that stocks remain in a healthy position, and by default lobsters are likely to have maintained their functional role in the ecosystem. CPUE analysis and previous estimates of maximum constant yield also provide some evidence for CRA 6 albeit considerably weaker. There is limited published information on the interaction between the lobster fishery and protected species. From the available information, the main potential interactions are likely to be with seabirds and marine mammals. Some quantitative information is available on endangered, threatened and protected species interactions, primarily through mandatory fisher reporting and fisher surveys. Although the level of interactions in the fishery appears to be very low, there is limited independent evidence to verify fisher reporting. 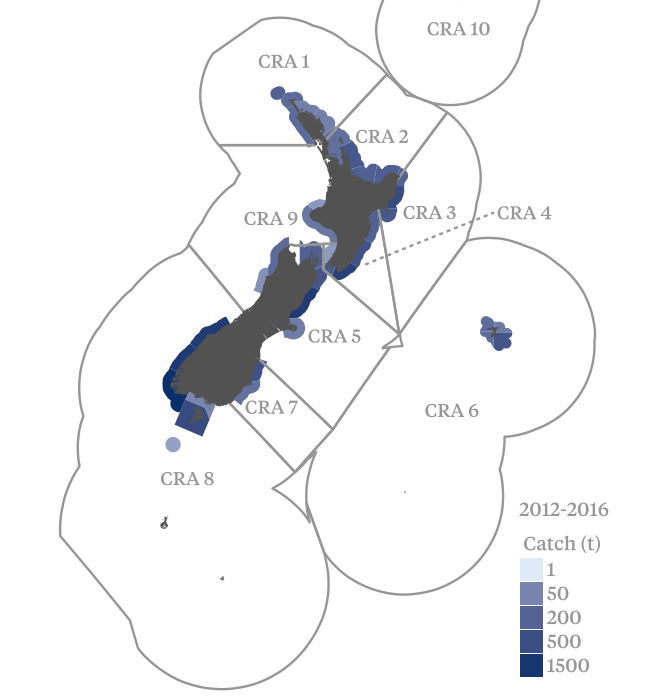 In the context of the various fisheries, the main uncertainty appears to be the level of seabird interactions in the CRA 6 fishery. Some (albeit anecdotal) quantitative data exists and this has been used to inform a strategy to manage impact through the National Plan of Action - Seabirds. The Fisheries Act 1996 and subsequent amendments provide a binding legislative and legal framework for delivering the objectives of Component 1 and 2. Sections 10, 11, and 12 of the Fisheries Act establish the requirements for the decision-making process, and Section 10 further requires the use of best available information for all decisions. This results in measures and strategies to achieve the fishery-specific objectives. The Fisheries Act requirement for best available information leads to scientific evaluation in advance of decisions. The Fisheries Act further requires consultation with such persons or organisations as the Minister considers are representative of those classes of persons having an interest in the stock or the effects of fishing on the aquatic environment in the area concerned including Maori, environmental, commercial, and recreational interests. The National Rock Lobster Management Group’s stock management goal is for all rock lobster fisheries: “to be managed and maintained at or above the assessed and agreed reference levels, using a comprehensive approach that recognises a range of customary Maori, amateur, commercial and environmental concerns and benefits”. For the five of the 6 CRAs operating under formal management procedures, the goal is given practical expression through the Management Plan. For CRA 6, the goal is achieved by setting TACs consistent with the intent of the Fisheries Act 1996 and the Harvest Strategy Standard. Together with the objectives outlined in the Act and Fisheries 2030, these measures arguably provide short and long-term objectives consistent with Component 1. While objectives broadly consistent with Component 2 are specified in the Act and Fisheries 2030, and are therefore implicit in the fishery specific management system, explicit short and long-term objectives consistent with Component 2 do not appear to be in place at this stage. All stocks except CRA 6 are very well placed against Component 1 performance indicators. The most recent stock assessment for CRA 6 was undertaken in 1996 and the position of the stock relative to reference points is unknown. Nevertheless, standardised CPUE has remained comparatively stable since the mid-1980s and current catch is within the range of estimates for maximum constant yield. Lobster pots are generally considered a relatively benign apparatus, although there is limited analysis of the overlap between fishing effort and potentially vulnerable habitats. The removal of lobsters from the ecosystem has been implicated in trophic cascades in some areas, although effects appear to be reversible. Maintenance of stock sizes above levels capable of producing maximum sustainable yield should assist to maintain the natural role of lobsters in the ecosystem. Target species (CRA 2, CRA 3, CRA 4, CRA 5 & CRA 8) - Stable: Risk scoring unlikely to change. Fishing mortality is below the rate that, if applied constantly, would result in maximum sustainable yield for all stocks. Target species (CRA 6) - Stable: No stock assessment/management procedure is planned. Bycatch and ecosystems - Stable: No major changes are expected to bycatch and ecosystem risk scoring. Management systems - Stable: No major changes are expected to management systems risk scoring.